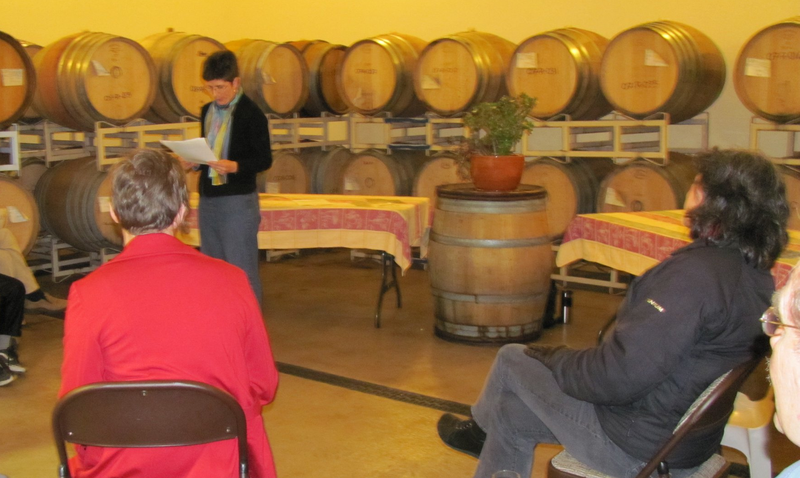 Over Valentine's Day weekend, to vary the admittedly delicious but oft-repeated wine and chocolate theme, I was invited to put together a writers' event for Winter's Hill Vineyard. We settled on the theme, "Word and Wine Tasting," and set out--tongue firmly in cheek--to prepare tasting notes that might pair our readings with suitable wines. We were three poets, two fiction writers, reading from published work and work-in-progress. 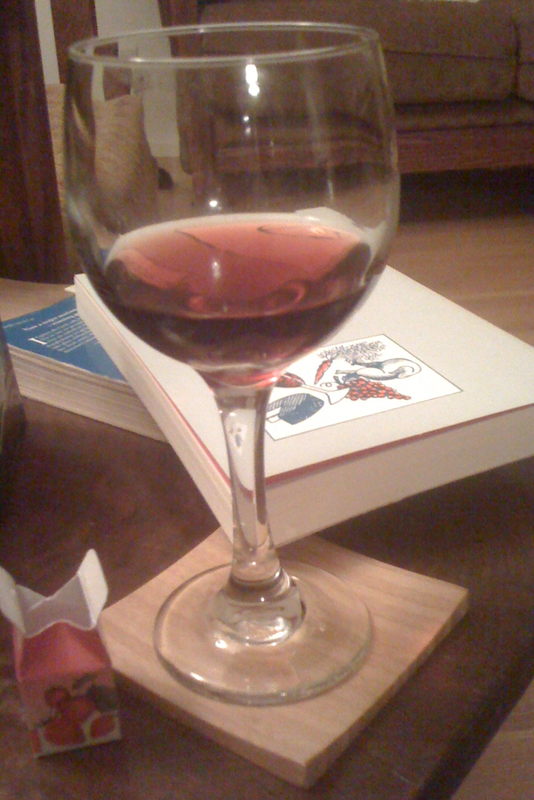 I thought it would be easy--piece of cake, glass of wine. Then I found that, like most writing exercises, it was harder than it looked. Or sounded. A complex dessert wine of character and verve makes the ideal foil to the Sgt. String mysteries excerpted within the novel. Pair a 2006 Winter's Hill Vineyard Golden Nectar with a culinary mystery with a hint of spice. Mineral and almond shell notes greet the nose before the wine opens to bitter citrus, sage, and white pepper, with candied nuts and sharp apple in the long finale--just right for savoring the solution to a crisp whodunit. Now, there's no need to limit word pairings to wine. I associate Anna Karenina with Cadbury Creme Eggs, of which I ate far too many while I was reading the novel in high school (not for school, if that matters). Might the disappointment of the occasional dud egg, its filling crystallized, not gooey, echo Anna's sadness and frustration? The smothering smoothness of chocolate, the beginning of a love affair? And then there's the question of forbidden treats, because there's no way I was allowed to eat as many of those chocolate eggs as I remember consuming. But these are pairings after the fact, rather than recommendations: a recollection of what I ate while reading, and so an association between food and book that is largely incidental, if enduring. Besides, one isn't supposed to read while eating, or eat while reading. The diet gurus' first commandment is to stop and pay attention to your food. 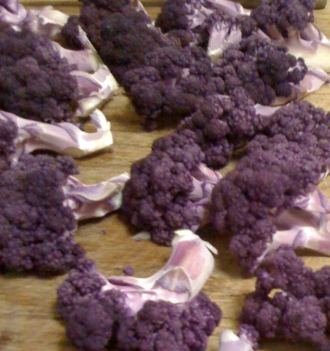 Still, what might one read with a plate of purple broccoli? What might one read to the cook? I remember hearing Diane Wakoski read a poem about a student returning a book with Cheetos stains on the pages. Another time, Marge Piercy read a poem about the pear you take along on a plane trip, that piece of fruit there's never an occasion to eat--too messy for the flight, and then your host offers you a snack--and the poor pear travels on, bruised, disintegrating, somehow too good to throw away. I am probably getting the poem all wrong--I just remember that pear, and the unwillingness to discard what one is equally unwilling to eat--so apologies to Piercy for mangling her poem, though perhaps there's some merit in remembering it all these years. Mistrusting my memory, I just went looking for Diane's poem. I found it in The Butcher's Apron. It's "The Fear of Fat Children," first published in The Rings of Saturn. (Bizarrely, on the shelf beside it, one of my own children had left a small pink eraser in a tiny cardboard carton decorated with strawberries and the warning: ERASER DO NOT EAT.) There are no Cheetos in the poem; maybe she just mentioned orange grease when introducing it, or maybe I imagined the whole thing. But there is wonderful food, and ambivalence, and fear. Still, these are poems about eating. Our tasting notes, by contrast, suggested what to drink while listening. Once started, it's easy to keep going. Pair a bitter café con leche in a Spanish bar with the newspaper left at the end of the counter, already read by an earlier-rising patron, its pages shuffled loose, fanning and fluttered. Match the frizzy astringency of ginger ale with embarrassingly bad love poems. A hoppy pale ale with a travel memoir that dances on the edge of credibility. Just about anything reads well with hot tea. It's best if the tea is still scalding, meaning I've just sat down. It's morning; I have time. The pages are crisp and I am ready to be pleased. Very nice. You have given me a whole new way to think about my reading -- and my writing. And a great way to justify my habit of snacking when I get stuck. I spent a long time pondering Turkish Delight, too, and for the same reason. For years, I thought it must be baclava--as a child, I had only the vaguest sense of what "Turkish" might mean.